A study of the history of Afghanistan reveals how a nation can be effected by its geography. For centuries Afghanistan remained a gateway to the Indian subcontinent and who ever wanted to conquer the region and take possession of its vast treasures had to deal with Afghanistan before setting his foot on the subcontinent. From the ancient times the Afghanistan was ravaged by many wars. The Afghans are a mixture of various races. from the Meditteranean to Centra Asia and China. Over the centuries people from different regions settled in Afghanistan and made it their home land. People came from such culturally divergent countries such as Iran, Middle East, Anatolia, Greece, Macedonia, China, India, Mongolia, Central Russia and settled there. They added diversity to the population but rarely lived in peace. It is difficult to believe that the history of this small and poor country is dotted with such famous names as Darius the Great, Alexander, Chandragupta Maurya, Ashoka, Kanishka, Menander, Attila the Hun, Genghis Khan, Timur, Mahmud Ghazni, Mahmud Ghori, Babur, Humayun, Akbar, Nadir Shah. It is also interesting to note that those who came to Afghanistan rarely managed to hold on to their victories or keep the land under their possession for long. Because of its strategic location, some times Afghanistan became a buffer between two hostile nations. It happened during the Mughal and the British rule. Some times it also provided sanctuary to the fleeing rebels or the vanquished rulers from the central plains of India. It happened many times during the Muslim and Mughal rule. At the height of its glory, the British army fought two serious wars in Afghanistan. Both times they suffered heavy causalities. In recent times the Russians fought in Afghanistan for 10 long years and withdrew having exhausted all the available alternatives to bring the mountains under their control. 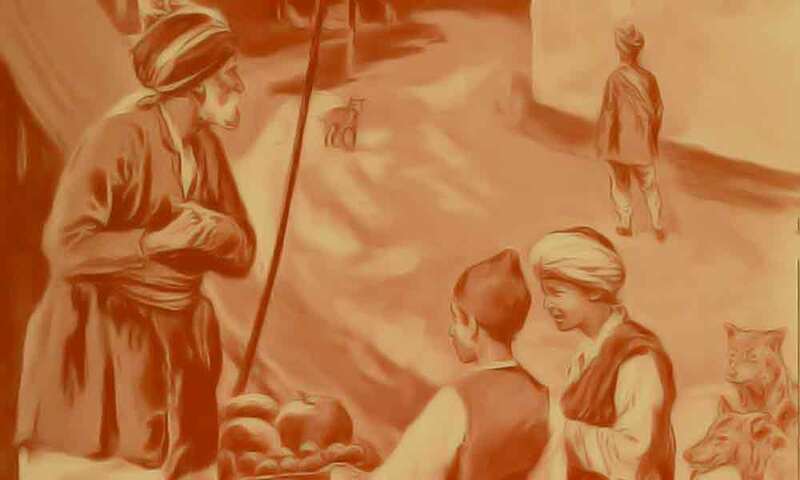 Afghanisthan was once center of Vedic Culture. The Indo Aryans definitely lived in that region before migrating further either upwards or downwards. For the Aryans Afghanistan was the land of the Gandharvas or the celestial beings. The Gandharvas were depicted in the Vedic scriptures as celestial beings, skillful in music, with magical powers, and beautiful forms. In status they were not equal to the devas, but regarded as higher beings with divine powers, mischievous at times, but mostly friendly and reliable. In ancient times, the valleys of Afghanistan must have resonated with the sounds of many caravans crisscrossing the country. The Indus valley people conducted their overland trade with Mesopotamia through Afghanistan. Their caravans carried a variety of goods that included rare and precious stones, minerals, food grains, resins, gold, silver and bronze, incense, Pistachios and more. After the expansion of the Vedic culture and the decline of the Indus valley civilization Afghanistan was invaded and occupied by the Persian army headed by Darius, the Great, (522 to 486 BC). We have little information as to who were ruling Afghanistan at that time. Probably it was part of an Indian kingdom from the Punjab region or was ruled by local chieftains. When Alexander marched towards India, he passed through the mountainous territories of Afghanistan and had to subdue many native tribes in the region. In the course of multiple battles he fought with them, his army was put to enormous strain and loss. Since his army was not familiar with the territory and his soldiers were not that skilled in mountain warfare, his army was literally exhausted by the time they reached the Indian borders and lost much of their motivation to fight further and march deeper into the subcontinent. The tired and frustrated soldiers insisted Alexander to return to their homeland. On their way back, Alexander had problems once again in the region and had to remain cautious till they crossed the borders of Afghanistan. riginally a cruel king, who allegedly ascended the throne after killing nearly a hundred of his own brothers, Ashoka underwent a life transforming experience at the height of his career. In the course of his conquests, which were many, he waged a bitter and bloody war against the people of Kalinga. This kingdom existed in those days in south eastern India, comprising the present day Orissa. The people of Kalinga were equally ferocious and stubborn people. Hence a bloody battle ensued in which there was a huge bloodshed on both sides and thousands of innocent people were killed, while materially nothing much was gained. The tragedy of the war and the ruin it brought upon so many people disturbed the emperor severely and changed his thinking forever. From a ruthless and ambitious ruler, he became converted to Buddhism and the ideals of compassion and non violence it preached. With in a few years after the war, he developed a philosophy of his own called the law of piety or dhamma, which was a hotch potch of Buddhist philosophy, Vedic dharma and the prevailing social and moral values of his times. For nearly two hundred years thereafter Afghanistan remained partly under the control of the Mughals and partly under the Saffavids of Persia. The eastern parts owed their allegiance to the Mughals while the western part to the Safavids. In 1747, following the assassination of Nadirshah of Persia, Mohammud Shah Durrani established his rule as an independent ruler supported by Pashthun tribal council. The Pasthuns controlled Afghanistan till the Communist regime came to power in 1978.